This week has had a flurry of CicLAvia news, with Mayor Villaraigosa’s press conference announcing the route for cicLAvia (also covered by Streetsblog and the LACBC blog) followed by the Mayor writing an article for the Huffington Post. Before all of that, LADOT Bike Blog had the pleasure of speaking last weekend with Bobby Gadda and Stephen Villavaso, two of the organizers behind October’s upcoming CicLAvia event. Bobby, Stephen: thanks for taking the time to talk with me. Though most LADOT Bike Blog readers are pretty clued in to bicycle issues in LA, could you just give CicLAvia a quick description for those who might not know what it is? Stephen: CicLAvia is a 7.5 mile route of closed streets that will wind from Boyle Heights, through downtown, through MacArthur Park, and out to East Hollywood. It will be on October 10th from 10AM to 3PM. Some key things that should be communicated to people who don’t quite know what this is: It’s not a race. There’s no starting points or ending points; you just pick it up where you want. If you live near one section of the route, you can go there and you don’t have to start in one particular place. It’s free. It’s just an open street and everyone’s invited. You don’t have to bring a bike. I recommend [a bike] if you have one, but you can bring a skateboard or just walk. Bobby: You can just bring a chair and hang out. Stephen: It’s a family event. We’re doing CicLAvia on a Sunday afternoon to make it a family oriented event, for the young and the old. Bring your kids, bring your dog, bring your grandma. So what role have you both played in CicLAvia and how did you get involved? Bobby: 2 years ago Adonia Lugo and I went down to the Ciclovía in Bogota (Ed. Note: Bogota was the birthplace of Ciclovías 30 years ago.) and we were amazed at not only how successful they were, but also that they are held every week. We moved to LA shortly afterward and went to an LACBC board meeting, just as newcomers, to ask about bringing a Ciclovía to LA. Stephen Villavaso was there and he really liked the idea. Stephen: I had actually never heard of a Ciclovía before then. I too was attending LACBC board meetings just to find some way to get involved. Bobby: Right, so LACBC formed a CicLAvia subcommittee including Allison Mannos and Jonathan Parfrey and others. I put together a lot of presentations and powerpoints about Ciclovías around the world and sharing my personal experience in Bogota. We gained a lot of momentum at the 2009 Street Summit and when we partnered with CARS LA. Stephen: Also, we incorporated about 3 months ago. We’re not officially 501(c)3, but we wanted to create a little bit of autonomy from the LACBC, who still acts as our fiscal sponsor and handles all the grant funding we secure for advertising and outreach. So how and when did the City get involved? Stephen: It was about a year ago that Jonathan Parfrey arranged a meeting with Romel Pascual (current Deputy Mayor for the Environment) and David Freeman (former Deputy Mayor for the Environment). That was the first time we got involved with the City government. David asked us to go out and really develop a grass-roots element, to go to each Neighborhood Council where we might want to have the event and ask them to pass a motion of support to show there’s a will for this event in the community. After getting support from Neighborhood Councils, we got support from the Council District Offices and from City Councilmembers. At that point, the Mayor’s Office really got on board. Have you guys looked at other successful models of Ciclovías in the United States, such as the Summer Streets event in New York? Bobby: Yeah, we looked at them and at Portland and San Francisco. All over, really. One thing that we see in every successful Ciclovía is that the City really takes ownership of the event and commits to making it happen regularly. Portland is an interesting example because brought in the idea themselves and did it as a top-down project instead of a grass-roots event. By doing that, they were able to bring in big sponsors like Kaiser. Stephen: We also went down to the Ciclovía in Guadalajara in Mexico. A group of Ciclovía planners from the US were invited down there by Gil Peñalosa to a conference where we all swapped stories, shared the challenges we faced, and learn from each other. What was really interesting was that American cities are all pretty much on the same page for Ciclovías. In Latin America, things are so different. Some cities in Latin America have their own “Department of Ciclovía”, where they have dedicated staff with uniforms and equipment and vehicles. At the conference, Guadalajara was celebrating their 360th consecutive Ciclovía, which they have every Sunday, and is now more than 40 miles of street. There were 200,000 people there that day. From what you learned, what does CicLAvia need to be a success? Stephen: It can’t be a single event. If you do it once, half the people showing up won’t even know what is happening. People have to get used to it first. If we are able to keep doing it, we’ll be able to see some real benefit from it. Bobby: The whole idea is: it’s a temporary change to the streets, but if you do it every week it becomes routine. If you know that streets will be shut down every Sunday, you know you can go take a bike ride or a walk. In Bogota, the Ciclovía really changed the culture of the city because people could rely on it happening. People in Bogota don’t even ride bikes that much compared to other cities, but they know that one day a week they can take out their bikes or they can go out and walk in a great setting. In your partnership with the City, who is handling what for the upcoming CicLAvia? Stephen: We’re raised almost $100,000 so far, and almost all of that is going towards marketing and outreach for the event, per our agreement with the City. The City is putting together the traffic plan and is providing officers for the intersections that will allow through traffic (Ed. Note: You can get a map of “soft closure” intersections here). As an engineer, I worked closely with LADOT on the traffic plan and we’ve provided copies of it on our website. The Mayor’s Office of Strategic Partnerships is looking into fundraising and sponsorships to keep CicLAvia going. Thanks so much guys. Is there anything else you want to add? Bobby: Just remember that CicLAvia is three things: Free, Fun, and Family. It’s not a race and it’s not a parade. There are going to be four “nodes” in the CicLAvia: one at the Bicycle Kitchen at Heliotrope & Melrose, one at MacArthur Park, one at the City Hall south lawn, and one at Hollenbeck Park. CicLAvia doesn’t have any events planned along the route, but we encourage groups to organize meetups through the CicLAvia blog. There’s a group of dog owners that are meeting up at one place along the route, there’s a dodgeball game scheduled, and the Sierra Club is doing something as well. We’re encouraging an organic expression from people participating. 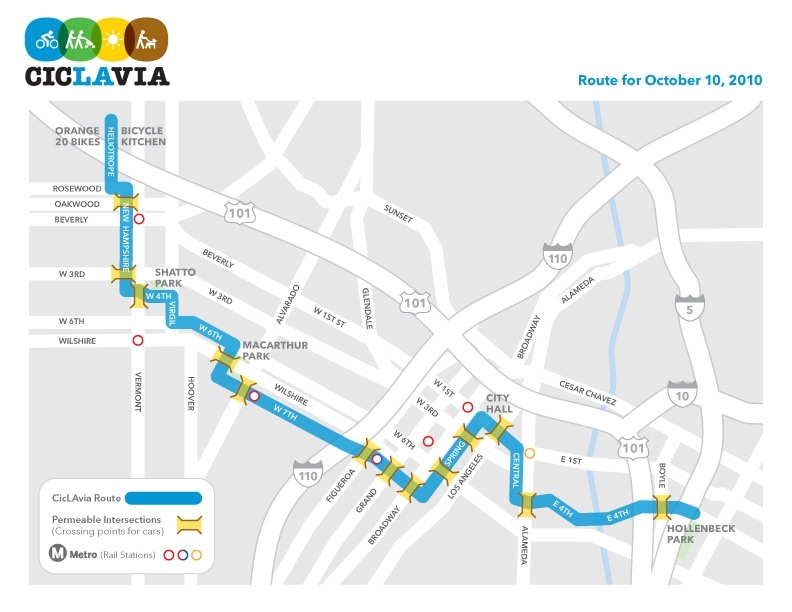 Don’t forget, CicLAvia is taking place on 10/10/10 from 10AM to 3PM. LADOT Bike Blog is proud to participate, and you’ll probably find us somewhere between the Bicycle Kitchen and MacArthur Park. We hope to see you out there as well.